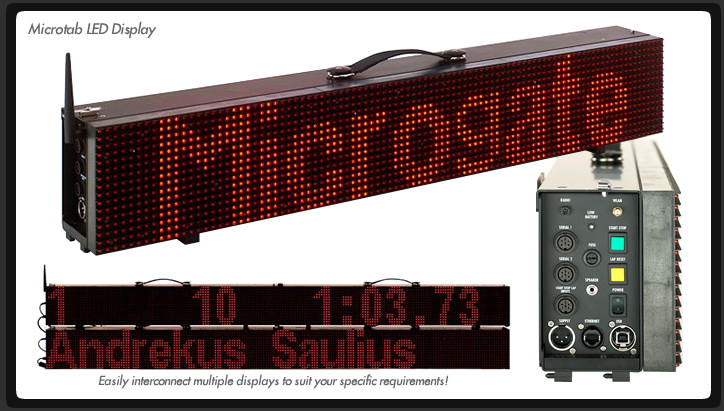 Sports Timing International is delighted to introduce the latest addition to its lineup of high quality MicroGate products: the MICROTAB LED Display. Designed and built with the same spirit of innovation as the rest of the MicroGate line, the Microtab system features high-output LEDs in a fully alphanumeric confirguration that allows the end user to build a display configuration that meets their exact requirements. The Microtab units are lightweight, require very low power, and can be configured to accept data in almost any format. They are also fully compatible with Lynx products.